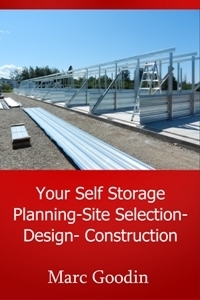 Interested in developing a self-storage facility? This book contains more than 150 proven ideas to save you time and money and make your project a success! You'll get secrets from 25-plus years of experience. Marc Goodin has designed dozens of site plans for self-storage facilities and many other businesses over his 25-year career as a professional civil engineer. He owns three self-storage facilities he designed and built, including one in Canada. He sold his engineering practice to concentrate full time on his storage businesses, and his proven business and marketing smarts have helped many facility operators develop successful and lucrative operations. If you purchase this book, the author invites you to contact him for one free hour of phone or e-mail consultation to discuss your industry questions. He'll also send you his "Self Storage Calendar," which includes 10 marketing ideas for each month of the year. The offer is valid for up to one year from the purchase date.